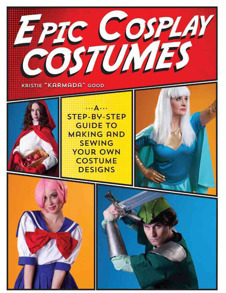 The ultimate guide to costumes and conventions, Epic Cosplay Costumes is packed with everything you need to know when participating in the most legendary hobby. Award-winning artist Kristie Good (aka Karmada) shares insider tips and techniques for creating your own designs-from hand-sewn garents to armor made with Worbla and EVAfoam. Along with her step-by-step guidance to attention-getting designs, her expert advice for making the most of conventions, posing for photographs and strutting your stuff at costume competitions will have you showing off your handmade cosplay in no time. Whether you´re a hero, heroine, villain, or side-kick, you`ve got the power to create amazing projects with Epic Cosplay Costumes!